The closure of the loops of the last row of the product knitted. 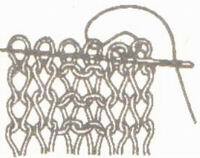 Upon completion of the knitting of the part of the loop the last row is closed, using a needle or a needle with a large eye. There are several ways of closing loops, the choice of which depends on the binding pattern. 1st method: Closed loops represent a smooth tail that can be run tight or weak, it depends on the thickness and looseness of the yarn. Edge detail, indoor the image is not stretched. Apply this way of closure to any pattern, to any of the details. This method looks like a consistent pulling one loop through another. Promazyvayut along the edge and the first hinge facialy binding behind the rear wall of the loop, resulting in one loop. The resulting loop is transferred from right needle back to left and promazyvayut it together with the following facial binding for the back wall of the loops. So knit to end of row. When the needle will remain one loop, the thread cut, leaving 3-4 cm, put it into the loop and tighten. When performing this method, you must ensure that the edge of fabric was not pulled. I'm doing this close very often use the short hook. Because it is not possible to tighten the loop, and the closing speed of crochet much faster than when closed loop spokes. At the closing of the reverse surface of the edge and the next loop promazyvayut wrong, then the 1st purl loop via the 2nd loop. Then just knit into 1 loop and received through each loop to stretch previous. The repeat until, until you have pinned all the loops. The thread is trimmed, the end of the thread to reach through the last loop. 2nd method: Edge details enclosed in this way is a stretchable pigtail. Apply it to any pattern, but most often with this method, close the elastic band with any number of front and rear loops, and also embossed patterns. The first (edge) loop off to right needle, knit the second pattern (front or reverse binding), resulting in the right-hand spoke out two loops. 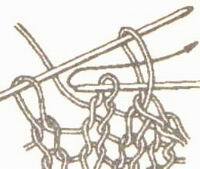 Then the left needle is introduced into the removed loop, gently pull it and push through it the second, knit the loop. Then knit the 3rd loop and drags her into the loop on the right needle. So knit to end of row. When on the left needle will be one loop, the thread cut, leaving 3-4 cm, put it into the loop and tighten. 3rd method: or closing of loops with a needle. In this way closed loop elastic bands do 2x2 1x1. The edge of the part falls naturally, freely stretched. Closing perform on open loops. They were smooth and not dismissed, finish knitting the details of several (3-10) series associated with additional thread (the main thread is terminated, leaving the end, equal to three lengths of close range). Remove the needle from the loops and priorivet the edge parts through a damp cloth. Dissolve the series associated with additional thread. Put in a needle with a large eyelet left over from knitting the main thread and perform the seam open loops, keeping the product face to his. From the front insert the needle into the first (edge) and second loop (Fig.1A). Tilting the item to yourself with the wrong side - in the first and third loop (Fig.1B). Then on the front side in the second and the fourth loop (Fig.1B). And on the reverse side in the third and fifth loops (Fig.1G). So, inserting the needle into two loops alternately on the obverse and reverse sides, perform closure loops around the row. From the front insert the needle into the first (edge) and second loop (Fig.2A). Tilting the item to yourself with the wrong side - in the first and third loop (Fig.2B). And on the reverse side in the third and fourth loops (Fig.2G). The front again in the fifth and sixth loops etc. 4th method: Closing loops with a needle last row of any pattern. This method is used in the case where it is necessary to obtain good stretch-edge features such as loop round neck "under the neck". The loops of the last row left on the needle. Cut the working thread leaving an end equal to the lengths of the three close range, put it in the needle. Insert the needle into the first loop on the front side, stretch through her thread and remove from the needles. a needle is inserted into the third loop from the wrong side and drags through her thread. Next, a needle is inserted into the second loop from the front side, and the output of the fourth loop on the reverse, etc. 5th method: Manual-closing hinges for smooth contours When attaching the hinges to close in the first row the desired number of loops by pulling one loop through another. In the second and subsequent rows of the 1st loop to purl, and to remove, as in the purl knitting. Then the 2nd loop to purl and pull it through the removed loop. Contour edges are closed in this way the mesh will be smooth.